That said stream trickles through the city creating two wings. In July it’s parched and grey, cracking like elephant skin. There are shoots and sprouts growing through the banks and flecks of green. Antique façades and bedizened churches line each side. The Università degli Studi di Parma (University of Parma) is one of the oldest in the world and occupies space across both banks. It was founded in the 11th century, around the same time as Parma’s cathedral and baptistery. The cathedral, with its famous octagonal dome, is one of the most recognised examples of architectonics in Parma. Stone lions guard the porch while at the pinnacle a gilt copper angel watches over all. During my visit she was undergoing surgery and closed to view after an unfortunate accident in which she was struck by a bolt of lightning; God’s finger-zap frizzing the poor angel beyond recognition. It’s the architecture and food that channel the spirit of Parma, and in that regard it’s no different from many Italian cities. There’s opera, of course, at the Teatro Regio di Parma (Giuseppe Verdi, the city’s most famous export). Most of the people you see in the Ducal Park off the main square are students lounging and kissing, and suspicious-looking Africans selling knock-off handbags. 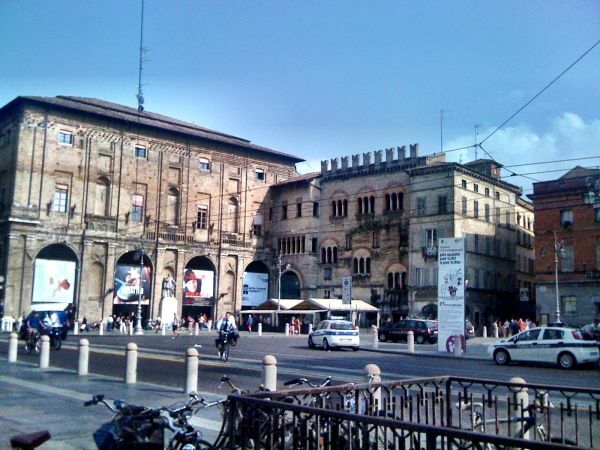 In the Piazza della Pace (Peace Square) there are bacaros and trattorias and the Palazzo della Pilotta housing the Farnese Theatre. I ate antipasti in the square and tried my first pastissada (horse) at Gran Caffé Orientale in Piazza Garibaldi. A bottle of Lambrusco was consumed as I watched couples romance, argue and communicate in hand gestures. Antipasti is the Parmanian staple. Parmigiano-Reggiano and Prosciutto di Parma both bear the PDO (Protected Designation of Origin) status, awarded to them by the European Union in order to protect their status and heritage. The PDO campaign is financed by the EU and Italy, with the logo guaranteeing the production, processing and preparation of the item under certification. This means Parmigiano-Reggiano is the only cheese that can be called ‘Parmesan’. 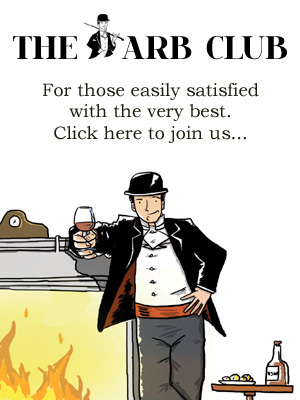 Businessmen sit during lunch and pile ‘Parmesan’ into their mouths, and groups of girls lick their lubricated fingers from the Prosciutto, savouring the fat on their lips. There are pretty girls in the piazza wearing wreaths, a sign they have graduated and reached maturity. They are full of summer merriment and celebrate with friends. 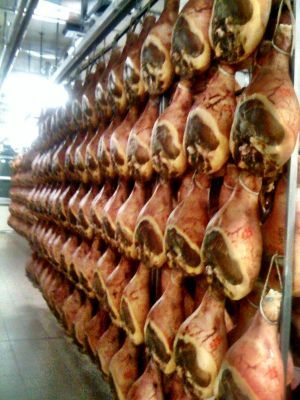 I’m given a tour of a Prosciutto factory in which are stored around 35 thousand Italian pig hinds. The meaty quads hang for a minimum of 12 and a maximum of 30 months, each branded at key stages of production to provide traceability. I’m struck by the smell at each stage in the large, industrial curing rooms. At 30 months they smell of wheat and soft bread. The entire process is natural, containing no additives or preservatives, but simply sea salt, air and patience. Parmigiano-Reggiano is produced using similar artisanal methods. Both the production of milk and its transformation into cheese take place in the provinces where some 270,000 cows produce the milk, squeezed from them twice a day. Morning and evening milk is mixed in copper cauldrons two metres deep and holding 1,100 litres. Stirring, coagulation and heating breaks up the enzymes until a myriad of tiny granules settle at the bottom where a large mass gathers. The curd is then removed and placed in a bath of salt water for 20 days. It is then scraped, dried, and placed on wooden shelves where it begins to mature. Inspecting, and the drumming of a little hammer, evaluates the structure and ageing process: 18, 22 and 30 months, resulting in its crystal-studied appearance and prominent nutty notes. The next day I board a train to Bologna and struggle to haul my bag on the overhead rack. I eventually succeed and it makes an almighty thud, but I knew when unpacking all that cheese at home, it’d be worth the slog. 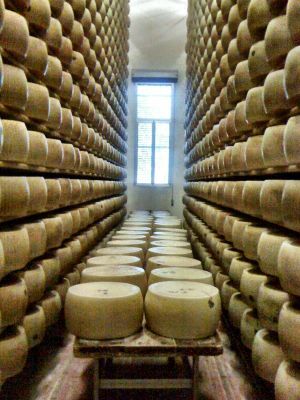 A wonderfully written piece with insightful information into the ham and cheese production in Parma.